Rich Halley is an avid hiker and has made a mystical journey through Hawkins Pass while crossing the Wallowa Mountains in Oregon. 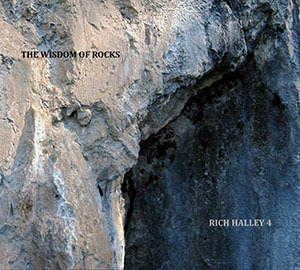 It must have been a memorable trip, because Mr. Halley has documented it in song and on two albums, the 2012 release, Crossing the Passes and this 2014 recording, The Wisdom of Rocks. On this latter recording the tenor saxophonist describes the indestructible vanity and the beautifully brutal and rocky promontories of Hawkins Pass. While not an academic geologist, Mr. Halley is, nevertheless, a “painterly” musician of considerable genius. His voice, like the granite and slate he describes in this recording, is rasping and blue-grey in hue. It is informed by the very mountains he describes and the musical topography is built upon multiple layers of tones and textures, along with his trombonist Michael Vlatkovich mimicking like some ingenious musician, the ancient layers of granite and slate of the very landscape he is passing through and which he paints with sound. And magically the physical aspect and narrative of these ancient hydrocarbons comes to life like some mythical beast that is at once awesome and tender. Perceptive and itinerant travellers have, throughout time described their experiential journeys, but only special ones manage to bring them alive. Doing it in song is all the more creditable. Mr. Halley’s is a voice that digs into the deepest recesses of the tenor saxophone. It is husky, yet with an ever so gentle vibrato that sometimes informs the whispering end-phrases of his long and growling lines. His seemingly interminable melodic excursions are reminiscent of saxophonists such as Sonny Rollins’ and Fred Anderson’s, but Rich Halley has his own extraordinary voice. It is primordial throughout this recording; as rough and guttural as the mountains that have inspired this music. This aspect of his musicianship accounts for how much he is a part of and in the tradition, as well as its future, in the raw tonal—and atonal—symmetry evinced by his speech-like smears and the guttural and murmuring utterances of his horn. This is especially brilliant in “The Atoll,” “The Wisdom of Rocks,” “Radial Symmetry” and “Conversation in Blue” all informed by the ancient carbon of which the mountains are made. Consequently Mr. Halley plays hard, sharp notes and the only blurs in his lines seem expressly designed to convey the mystical energy of the mountains. The Rich Halley 4 is probably one of the few, if not only, ensembles that could handle this kind of repertoire that its leader puts out. Mr. Vlatkovich’s trombone is a worthy complement to Mr. Halley’s saxophone. The trombonist lets his voluptuous tone describe a feminine god inhabiting the rock, while Mr. Halley appears to bring to life her male paramour. But the musical integrity does not stop there. 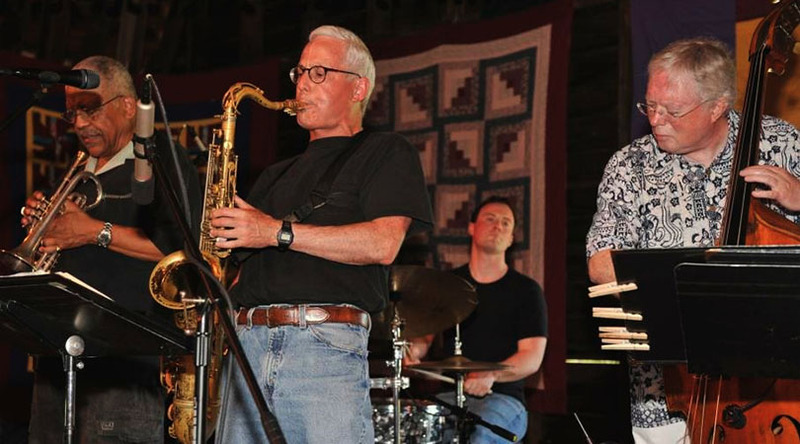 The bassist Clyde Reed and drummer Carson Halley are the only known rhythmists who can make the same vaunted music as Rich Halley and Michael Vlatkovich. Thus completes a classic quartet in the grand manner of John Coltrane’s legendary one. And with the two albums that describe the journey through the Wallowa Mountains, Rich Halley has produced music that is truly exquisite and memorable in an everlasting sort of way. Track List: The Atoll; Trip Through Turbulence; A Brief Note; The Wisdom Of Rocks; Faint Scattered Lights; The Get-Go; Heat In May; Tale By Two; Radial Symmetry; The Semblance Of Stealth; Of Fives And Sixes; Conversation In Blue. Personnel: Rich Halley: tenor saxophone; Michael Vlatkovich: trombone; Clyde Reed: bass; Carson Halley: drums.